Okay, we want it all! by the charm of the 1950s. All things kitsch, flowery and wonderful! The brand is loved by make-up artists and celebrities alike, and has officially landed in our very own Dunnes Stores. 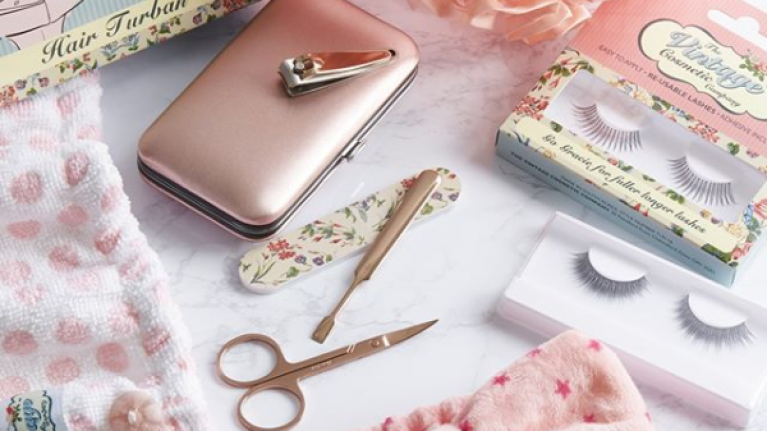 These STUN cosmetic accessories have been sold globally since 2015 and cover seven distinctive categories. The Vintage Cosmetic Company Co-Founder and Commercial Director Clare Tarry is super excited about the launch into Ireland. "This year is an exciting year for us: We have welcomed the business partners who brought Benefit Cosmetics to the UK from America, Gail Bokarski and Ian Marshall onboard as Shareholders and launched 17 products into Dunnes Stores." This classically inspired and high-quality range of products include beauty tools, such as tweezers. a manicure set, and three different types of hair Brushes. But the best part is that all these goodies are finished in their signature floral print - bringing 1950’s glamour back into everyday life.